With Wednesday’s addition of the bantamweight brawl between Mitch Gagnon and Alex Caceres, nine bouts have now been confirmed for the “UFC Fight Night: Hunt vs. Bigfoot” lineup. The December 7 event (airs live December 6 in North America) takes place inside Brisbane Entertainment Centre in Brisbane, Australia. 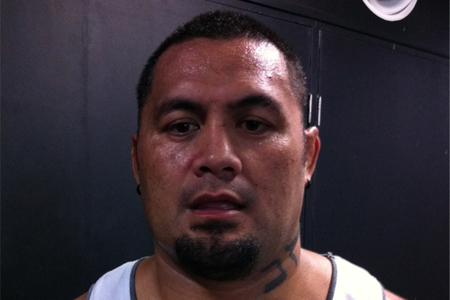 A heavyweight shootout between Mark Hunt (pictured) and Antonio “Bigfoot” Silva headlines the freebie fight card. Former light heavyweight champion Mauricio “Shogun” Rua and James Te Huna serve as the co-main event. Fox Sports 1 will broadcast the main card live in the US.